Most of us eat too much salt, which can increase your blood pressure and put you at greater risk of developing heart disease or having a stroke. Even if you don’t consciously add salt to your food, you’re not necessarily in the clear as many foods contain added salt and you may well be consuming a lot more salt than you realize. This is a worrying thought but you can easily cut down on your salt intake by following these hints. Know which foods are high in salt. Some foods contain a lot of salt including bacon, cheese, ham, olives, salami and smoked meat and fish. If you’re currently eating these kind of foods on a daily basis, you’ll definitely want to start cutting down on your consumption. Other foods are potentially high in salt if you don’t shop around for the options with the lowest amount of salt and these include breads (including crumpets and bagels), pasta sauce, crisps, ready meals, soup, sausages, breakfast cereals and condiments (including ketchup and mayonnaise). Get into the habit of checking the salt content and you might well be surprised at how many of your favorite products contain salt – and not just a little bit either. As well as checking the nutritional labels for a full breakdown of how much salt is included in the product, don’t forget to also have a look at the list of ingredients. If salt is featured towards the beginning of the list, the product definitely contains a good deal of added salt. 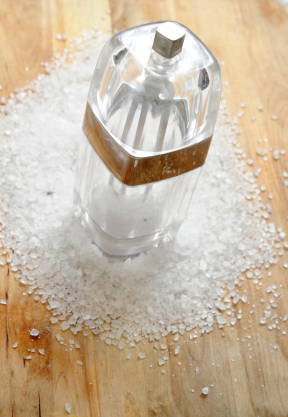 Make a point of choosing low-salt alternatives where possible. Use alternative seasonings on your food. If you can’t live without adding salt to your food, experiment with different options such as black pepper or fresh herbs. These can add some much-needed flavor to your food without having to reach for the salt. Make sure that you get enough potassium. If you’re worried that you’re consuming too much salt in your diet, potassium can counteract the potential effects on your blood pressure but don’t go overboard – experts recommend that you don’t exceed 4,700mg per day. Leafy green vegetables are a good source of potassium. Eating less salt when eating out. Pizza. Pepperoni, ham, bacon and extra cheese will contain lots of salt so if you’re going to be eating pizza, go for a vegetable or chicken topping instead. Pasta. Pasta sauces can be notoriously high in salt, especially if they contain cheese or bacon. Tomato or vegetable-based sauces are better options. Chinese. Plain rice contains less salt than egg-fried or pilau rice. Salads. Dressings can be high in salt so you’re better off asking for it on the side so that you can have more control over how much there is on your salad. Sandwiches. If you’re grabbing a bite to eat for lunch, avoid fillings like ham and cheese. Better options include chicken, egg, or hummus, which are all lower in salt. It’s true that our bodies need some sodium to be able to function properly but many of us eat far more than this and are potentially putting our health at risk as a result. Most of the salt that we consume on a daily basis has been added to our food so even if you’re not in the habit of adding extra at the table, you’re probably consuming more than you think, especially once you start checking the nutrition labels and take stock of exactly how much salt you’re consuming in the average day. So, how much salt is in your diet? Are you in need of some changes? I think I recently read a study that 90% of Americans eat too much salt. My wife and I have really taken our health seriously as of late. Despite being in our late 20s and in decent shape my wife had some high blood pressure and I had elevated levels of cholesterol! I mean, most people would look at us and think we’re completely healthy but that’s hardly ever the case. There is SO much salt in everything we eat. If you buy anything that comes in a can, box, or frozen boxed dinner then it’s likely it has an extreme amount of Sodium. I couldn’t believe it when I started reading labels carefully. My eyes were opened when I started reading labels to. Like you, we also look healthy on the outside but that doesn’t mean we can ignore good eating habits. The inside stuff really matters. We try to eat low sodium and never eat processed foods which helps a lot. Glad to hear you and your wife are doing something similar. It is really important to look after yourself. You sound like my hubby. He too has a salt tooth. I am glad to hear you are making an effort to reduce your intake. As far as salt free options, you can try Mrs. Dash http://www.mrsdash.com/ or Benson’s Gourmet Seasonings http://www.bensonsgourmetseasonings.com/. It’s amazing how much added salt (and sugar!) is in our foods today–it makes me sick to think about it! I think reducing your salt intake is hard for some just like saving money is for others–you know you should and that’s good for you, but you have to be willing to make the sacrifices necessary to do so! Makes me sick too. This is why I don’t eat anything out of a box or package. Whole foods are my go to. You said it well HH. Doing anything good can be a challenge and does take sacrifice and if you don’t want to make that sacrifice, you aren’t going to improve your situation. While I enjoy an occassional salty treat, we really started steering away from salt several years ago. We use Sea Salt instead. Once you skip salt, you can really taste it when you eat restaurant food as you mentioned. I actually find that I retain a lot of water when I eat salty foods. But, you are right, we do need some sodium in our diet. The doctor that wrote the adrenal gland stress book that I read said that a half a teaspoon a day is required for people under a lot of stress. Yes, as much as you need sodium,you only need a very little amount daily. Sea salt is still salt though so remember that. There isn’t much difference in the sodium levels compared to other salts. Hot sauce has a lot of sodium. I think any kind of condiment is guilty of having too much sodium. It’s difficult to avoid salt and I need to do a better job. At least we don’t use much salt when we cook at home. Glad to hear you try to cook with less salt at home. That is a huge first step. As far as condiments go, you are right. Many of them have high sodium levels. A few things you can use is salsa, red pepper flake, and mustard to add heat to a dish without adding salt. You’re speaking directly to me, Miss T. With all of the reading that I’ve done over the years on health and fitness (and applied many of them as well), you’d think that I’d get this one right. Cutting down on my salt intake is one of my biggest projects for my life, and I must get really serious about it; especially if I want to live a long and prosperous life. Glad you know you need to make a change. That is the first step. Salt, like anything else, can be hard to cut out. It can be addicting just like sugar and fat. The hardest hurdle to get over is to start tasting actual flavour and not salt. Many people find that when they try to cut out salt, things taste bland which really isn’t true. They are just used to tasting the salt and not the flavour. Stick with it though and in time your taste buds will adjust. The earlier you start the better. High sodium can cause problems at any age. Glad to hear you are working on making some changes to your diet. Better now than later. I started looking at my sodium intake last year, and I was eating relatively healthy at the time. Soups were my favorite go-to’s, but when I saw how much sodium was in each, I forced myself to switch to Healthy Choice. I spice their soups up with alternate spices because they can be a little bland, but I’m getting a lot less salt now. Glad to hear. I find when people actually take a moment to look at sodium content, they are shocked at the amount. It is good to know that you are watching you intake. I’ve noticed that my diet has increased significantly since I’ve got married, but have made a concious decision to watch the my salt intake of late, even went so far as to hold the salt on my chippy tea last Friday (Fish and Chips for dinner with plenty of vinegar, I know unhealthy but oh so nice!). Good stuff. Making these changes can really add up over the long term. Being aware is the first step so good job. The sodium content in package foods can be sooo high. We try to opt for reduced salt products when we buy crackers or taco mix. Sausages also have a ton of salt in them. I was shocked to see how much of the suggested daily intake lingers in one sausage. I know it’s nuts. We also try to opt for less salt. Not buying things in a box helps for sure. And yes, meat can be a huge culprit.